Just this morning I was sitting down to have my quiet time and my phone buzzed with an incoming message. It was a dear friend who is walking through something very difficult. My heart just ached for her as I tried to think of ways to help her through this trying time. I’m just little old me and I’m not really sure what I can do to help anyone. Have you ever felt that way? Have you ever felt like you were too small or too insignificant to make a difference? Have you ever wondered if the things that you are doing really matter? Friend, they do. You are a salt shaker. You are a shining light. Each and every one of us has the ability to make a difference in this world. We have each been placed in our particular set of circumstances with our particular group of family and friends because we have the ability to make a difference. We are called to be salt and light. How? How do we make a difference? How do we bring out the God-flavors of the earth? How do we bring out the God-colors in the world? How do we shine? I’ve got a few fool proof methods that always seems to work for me. When someone comes to me with a need, I know I can’t rely on myself. I would probably let them down. Instead, I do my best to shake a little salt and shine a little light. Here are three ways I believe we can do that no matter how small or insignificant we feel. My first response is always to bring any situation or any person before the throne of God and cover them in prayer. He can do more to help in a situation than I could ever dream of doing. Prayer moves mountains, friends. James 5:16 CEB says, “…The prayer of a righteous person is powerful in what it can achieve.” Matthew 18:20 CEB reminds us that “Where two or three are gathered in my name, I’m there with them.” It is powerful. Don’t ever underestimate the value of praying for someone. This life can be a hard one and there is no shortage of trials, but when someone comes along and lifts you up with an encouraging word from the scripture, things seem just a little easier. There is so much power in our words. They have the power to hurt or to heal. They have the power to lighten a load. They also have the power to point someone to Jesus. Have you ever been really struggling and someone spoke life right into your weary heart? C.S. Lewis’ quote on friendship is a favorite of mine. He says, “Friendship is born at the moment when one man says to another, “What! You too? I thought no one but myself…” This world is full of the fake and the edited. We often only see the very best of a person. People can easily get caught in the trap of comparison. It can be disheartening to someone who is struggling. Counteract this. Be real, open, and honest about your life and your struggles with the people in your life. Help them to see that they aren’t alone and that they have a true friend in you. These three tips have been tried and true ways that I’ve found to make a difference in the lives of others. I pray that they are helpful to you! I hope that you will use them and go forth and shake a little salt and shine a little light! There are days that seem really long and my patience is running really short. My attitude isn’t right and I just don’t feel like being in a good mood. Things quickly turn ugly and I find myself in far different situations than I had originally hoped to be in when I planned my day. We all have those days, right? That is when we need a do over. We need to be able to hit the restart button and just have a new beginning. I found myself in that place, that place of just really needing a do over, a couple of times this week. I needed a do over with my husband. We had been planning a date night all week and I was so excited for the opportunity to get away and spend some time together. All was well as we were preparing to head out the door, until he said something that just rubbed me the wrong way. It wasn’t intended to be hurtful, and truth be told, I was being far too sensitive and getting upset over nothing. It didn’t feel like nothing at the time though, and I was mad. My husband is pretty amazing at reminding me that we shouldn’t get upset over little things and apologizing and moving on. I’m not. I tend to stew. So I did what any mature Christian woman would do when he suggested we just start the evening over. I pouted and sat there with my arms crossed over my chest as we drove to dinner. Gently, my husband said, “I don’t want this to ruin our time together. I’m trying to save our evening and let this all go, but it doesn’t seem like you are.” He was right. Our evening needed a fresh start. I took a deep breath and reached for his hand, and took the opportunity to claim a do over. Something similar happened with my kids this week. A late night last night meant tired and grumpy boys this morning. I had planned a fun day for the three of us to take advantage of these last few days of summer vacation. However, the kids kept arguing and complaining and whining. The morning wasn’t going well for any of us. A big part of me wanted to just scrap the hole day and send them to their rooms to go back to bed. Instead, I thought about what my husband said last night. Maybe instead of just continuing down the wrong path, we could just hit the restart button on our day. We could all take a do over. I called the boys in and sat them down and shared this all with them. I told them that one of the things that I love most about their daddy, and one of the things I love most about Jesus, is that they both offer the opportunities for do overs when we need them. Lamentations 3:22-23 says that his love and compassion are new every morning. Ephesians 2:4-5 reminds us that God is rich in mercy because of His great love. Another great verse is 1 John 1:8 that tells us that if we confess our sins, he is faithful and just to forgive us and cleanse us from everything we’ve done wrong. He just asks us to confess and repent and all is forgiven. It is an opportunity for a do-over. My kids had already come to me and apologized. They knew what they had done wrong and we had discussed it. I took a deep breath and looked into their discouraged faces. And I gave them a do over. Just like Jesus has done for me COUNTLESS times before. Just like he does for me every time I mess up. No matter where you are or what kind of sin is in your life, there is always an opportunity for a do over. There is always a chance at a fresh start. You can never be too far gone that you can’t come to Jesus with a heart of repentance and confess and ask for a clean slate. We can, and should, do it with the big things in life as well as the little day to day things. If you need a do over today, just ask. He is faithful and just to forgive and his mercies are new every morning. I’m a work in progress. God is continually refining me and I’m grateful for that. I love that He is working on me, pruning me, and helping me to grow. I don’t know about you, but it seems like, for me, one of the areas that requires the most refinement is parenting. Being a mom is a challenging job. It requires us to be selfless, patient, loving, generous, tender, and all of those other wonderful qualities that seem to go against all that is natural in us. For me, there has been a learning curve with this. My boys are 13 and 9. I was kind of hoping I’d have it all together by now. I don’t. I love my kids and they know this, but I also make some mistakes parenting. My kids know this too. We are on a journey together and they know that we are all growing and learning through the process. Tonight I learned some things and I thought just maybe someone else might find them meaningful too. These lessons came after a rough start to our bedtime routine. (Please tell me you’ve been there and that this doesn’t only happen in our home.) It was going so well, and then, all of a sudden, it wasn’t. Meltdowns ensued. Consequences and corrective conversations had to happen. The correction wasn’t really very sweetly given and even less sweetly received. Earlier in the evening, the boys had asked to sleep in my room, but I had taken away that privilege as a consequence of the craziness that we had all just participated in. Tears were shed. By the time I had both kids in bed, we were all a little frazzled. I was frustrated and worn, but was trying to bring a little peace back into our night before we all went to sleep. I asked the boys to sit beside me in Gavin’s bed, and I reminded them that today had been a little rough and we needed to all work a little harder at being loving and respectful tomorrow. I pointed out some of the areas that we struggled with throughout the day and mentioned that we all should try to do a little better tomorrow. The list wasn’t a short one. It hadn’t been our very best day and I wanted to use this as a teaching opportunity so that we could all improve in the areas that were problematic for us. I wanted to drive this lesson home so that it stuck because I wanted tomorrow to be better for all of us. You know what? He was right. It actually had been a pretty good day. It wasn’t perfect, there was way more good than bad. However, in my frustration, I was focused on all the bad moments that had happened. Not only that, I made sure we were all focusing on them. I was wrapping up a pretty good day together by dwelling on all of our mistakes. Don’t we all tend to do that sometimes? We forget about the day’s blessings because we let ourselves be consumed with the frustration of the moment. I am all for looking at the areas we struggle in and finding ways to improve in those areas. We all need to do that from time to time. It is an important part of the growth process, but there is also a lot to be said for extending a little grace and mercy sometimes too. God does that for us so often. I am afraid that I don’t do it nearly as often. I thought of the verse that I had read earlier that morning in Romans 2:4b that says that God’s kindness is meant to lead us to repentance. Maybe a little kindness sprinkled in with my correction would do more to encourage a repentant heart in my kids than my list of wrong doings. Hmmmm, God, are you trying to tell me something? I finished tucking in my boys and then jumped into the shower to just physically and literally wash away the day. Some of my best thinking happens in the shower, and tonight wasn’t an exception. I couldn’t get Gavin’s words out of my mind. I was reminded of my tendency to look at the frustrating moments and forget the bigger picture. I was also reminded of God’s mercy and grace, and especially His kindness. I thought about the times my heart was most often turned toward repentance, and I saw that it was most often due to His kindness. He doesn’t throw my mistakes back in my face and make me confront them over and over again. When I’ve asked for forgiveness and owned my failures, He forgets them and loves me like they never happened. He’s way better to me than I deserve. He is so patient and longsuffering with me. I finished my shower and went back into my kids’ rooms. It was obvious that both boys were having a hard time falling asleep after the emotional evening. I told the boys what the Holy Spirit had pressed upon my heart. I told them that most often, when we need God’s kindness the most is when we deserve it the least. We had obviously had a rough night, but what we all needed was a little grace, love, mercy, and some kindness. So, here I sit, typing away. I’ve got one boy curled into his sleeping bag on the right side of my bed. The other is sprawled across the top of his sleeping bag at the foot of my bed. My heart is full as I reflect on the pretty good day that we had. We definitely had a few hard moments, but, those few hard moments allowed us all to be reminded of the grace, love, and mercy that is always there waiting for us. Those moments reminded me of God’s continual kindness that draws me to repentance. Those moments, the words of my sweet boy, and the Holy Spirit, taught me a lesson tonight that I hope sticks with me for a long while. *This blog post was originally posted at Bronwyn Lea’s blog (www.bronlea.com). I had the wonderful opportunity to guest post on her blog yesterday. She’s a wonderfully talented and inspirational writer! You will love her blog! Please welcome Bobbie Schaeperkoetter to the blog! Maybe I’ve let myself be defined by the wrong names for long enough. And maybe you have too. Unworthy. Unloveable. Unattractive. Selfish. Spoiled. Out of touch with reality. Irresponsible. Snob. Untalented. Liar. Cheater. Judgmental. Failure. I’ve been called these names and many more. These, and others, are words that I’ve heard spoken about me nearly all of my life. They are words of hurt and pain. They are words that cut deep. They are words that I’ve felt have left a scar on my poor tender heart. Sometimes those words were spoken by others. Sometimes I just felt them because of a person’s attitude of actions. Most often though, the words that have cut me the deepest, are the words that I’ve spoken to myself. The worst names are the ones I gave myself. This isn’t the regular state of my heart, but I have been my own worst enemy at times. I’ve doubted my heart, my worth, my skills, my actions, my looks, my motives, and my talents. I’ve focused on my negative qualities far more than my positives. I have let fear and doubt rule me for so much of my life. I’ve stood in my own way far more than anyone else ever has. I’ve let my past, my failures, my mistakes, and especially my sins define me for far too long. I’ve been a slave to the names. I’ve often felt locked in the prison of these words. I’ve let myself believe them. I have believed that I am unworthy and unloveable. I have believed that I am a cheat and a liar and a failure. And for some reason, I’ve never fought back against those names. Maybe I kept letting myself be defined by those names because a small part of me believed each one of them for one reason or another. Maybe it is because no one knows me like I know myself. No one knows every detail of my past and every struggle that I have walked through or every mistake that I have made. But just maybe, I have listened to the lies that the enemy has whispered into my ear for far too long. This morning, I woke up to a text from a dear friend who is in the middle of a very difficult situation. She is feeling defeated. She is feeling defined by her circumstances and her situation. She is believing the names. She is believing the names that others have called her, but most often, she is believing the names that she has called herself. And my heart broke for her. And it broke a little for myself because I have done the same thing so often. I have so many friends and family members who are in the middle of very difficult situations. Some are there as a result of their own choices but some are just a victim of circumstance. Regardless of how they got to where they are, many of them have one common bond. They’ve let the names they have been called define them. They have believed the lies too. They’ve believed the lies that they are their circumstances or their situation or their mistakes. They’ve believed the lies that they are their sin or their faults or their failures. They’ve believed the lies that they are what other people have said that they are. They have let those names define them just like I have. That is not the case for them, it is not the case for me, and it is not the case for you sweet friend. I am not those names that others have called me. 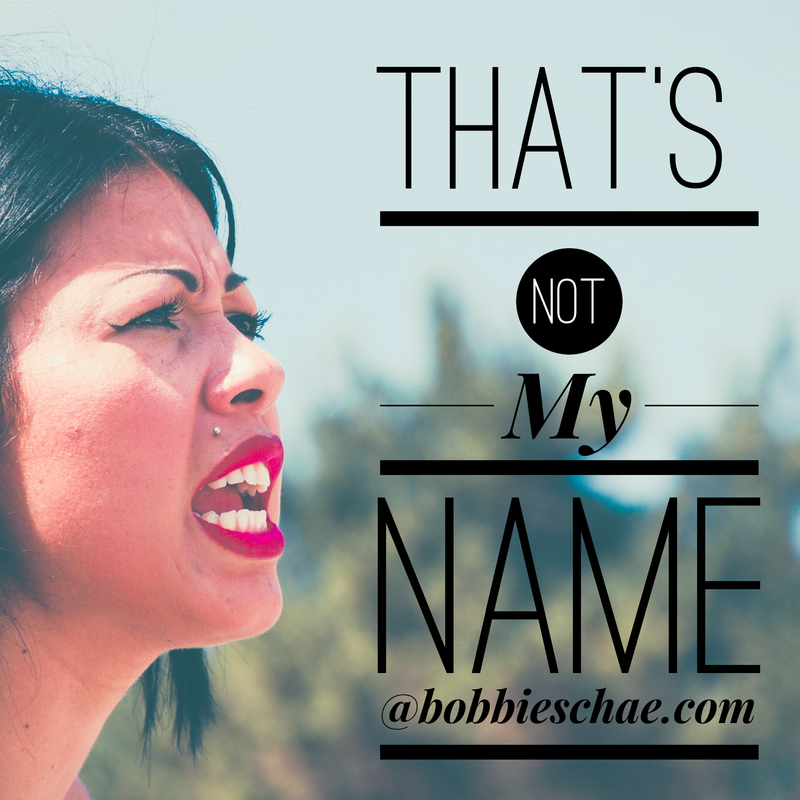 I am not those names that I have called myself. I am not those names that the enemy has whispered in my ear. I am not defined by my past or even my current situation. And neither are you. If we are a follower of Jesus, then those names do not define us. His name does. We are defined by a God who loves us more than we can even begin to fathom. We are named by the one who calls us chosen, loved, redeemed, beautiful, precious, forgiven, and new. Let go of those old names and embrace the name that Jesus has given you! 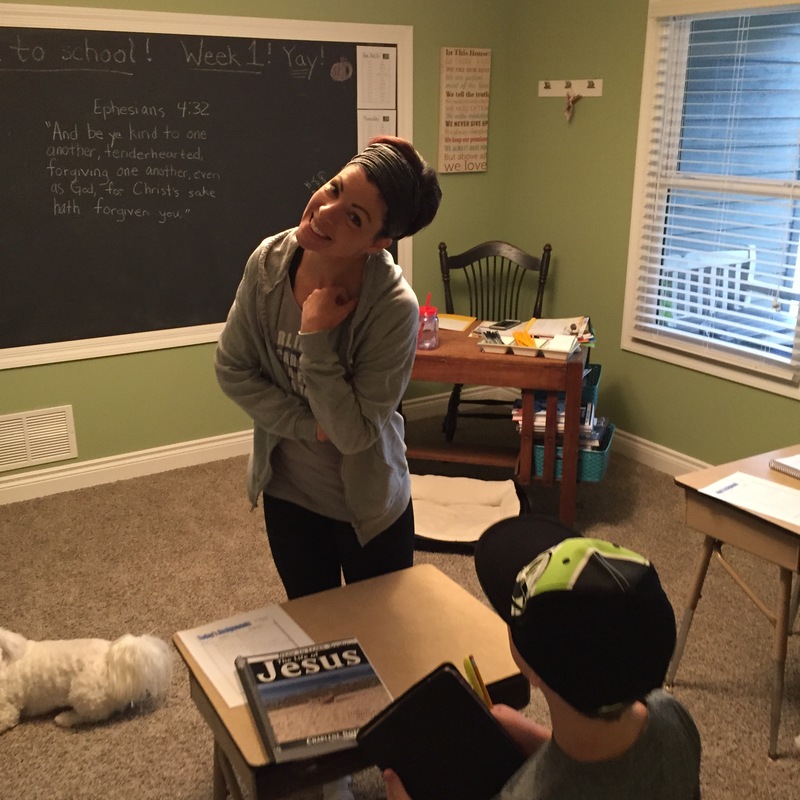 I’m a home school mama. (Yes, that’s me in all my yoga panted, head banded, hoodied glory on a typical day.) I have two sweet, wild, chaotic boys that I am beyond blessed to spend my days with. Every Day. I love it. Really, I do. But, can I be honest, just like any other job, sometimes it is HARD WORK! These boys refine me and test me and try me. They challenge me and make me a better person, a better mom, and a better Child of God. They question me… about EVERYTHING… and make me really think about things. They stretch my patience to the limits. They make me laugh and sometimes they even make me cry, because being a mama is a tough job! Can I be honest again? Sometimes I wonder if I’m doing it right and if it’s worth all the effort. I know I fail a lot. I know I get a lot right too. I hope that the scales balance and that these boys get the best I have to offer more often than not. These challenging and amazing fellas have been trusted to me by my Father and I desperately want to do right by them and by Him, so I just keep pressing on and praying hard and leaning on God for my strength. But did I mention that it is hard work? Things that matter typically are hard work! Things that are meaningful take a lot of effort. They are difficult because they are shaping us, growing us, and challenging us to be and do better. They require us to lean into Him for encouragement, support, and help. I think that is kind of the point. Do you know what I just love though? 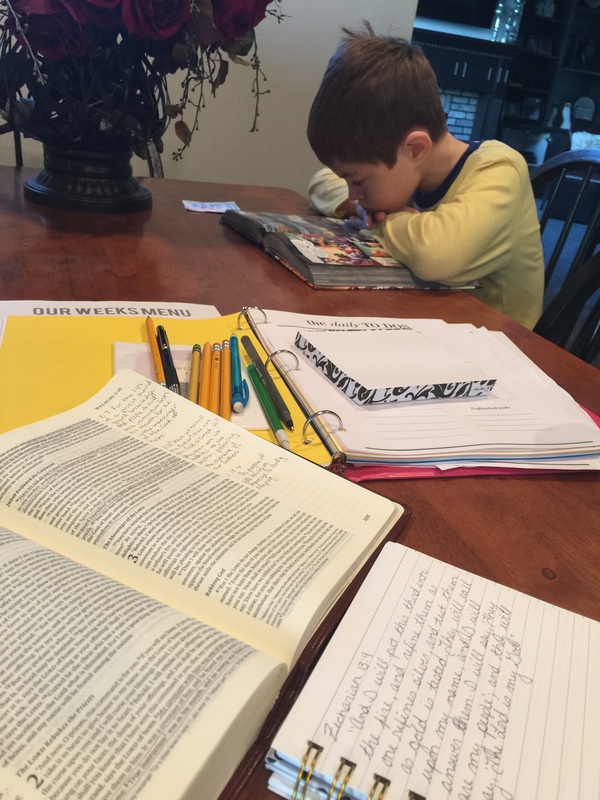 I was sitting at my usual morning spot, reading my Bible and writing out a verse in my journal that spoke to me, Zechariah 13:9 ironically enough, when my sweet 9 year old walked in with his Bible and sat down beside me and began reading from his. He didn’t interrupt me. I got a quick smile from this dimpled cheeked, bed headed cutie and he opened God’s word and dove in. It was just what I needed this morning to give me that boost to keep on keeping on! So today, whatever it is that you are pushing through, whatever work God has called you to be faithful to; I just wanted to give you a little encouragement. It can be tough. It can make you weary and you may question yourself. It is hard work and it is suppose to be. Hang in there. You’re on the right track. Keep your eyes open for little messages of encouragement from God. Keep on keeping on because he is refining you, growing you, stretching you, shaping you, and teaching you to lean into Him.